"Remove rogue security software from your computer"
A rogue security software, also known as just a fake antivirus, is a malware that masquerades itself as a legitimate software, and tricks you into installing it on your computer using social engineering. For example, there was a rogue antivirus called Security Essentials 2010 that users confused with Microsoft Security Essentials. Instead of protecting the machine, it installed a Trojan on the infected computers. 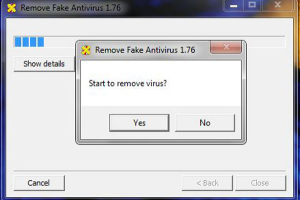 Fortunately, there is an application called Remove Fake Antivirus, that can effectively detect and remove rogue security software on your computer. Remove Fake Antivirus requires no installation, as it only consists of a single executable file. All you have to do, is to double-click the file and the scan will begin, which can take several minutes depending on your processor speed. Remove Fake Antivirus will detect and remove rogue applications from your system. Once its job is completed, it recommends you to scan your computer again, but this time using a genuine antivirus software.